Hello Kitty is the dj at Sanrio headquarters in Tokyo, Japan. I clearly recall my first trip to Japan. I arrived at Narita Airport after a 15 hour flight, having slept very little because I was so excited to actually get there. It was still rolling through my head: Japan! Land of the rising sun! Cultural melting pot! This is where anime comes from! I did my best to prepare, and that's why when I got to the airport and saw their adorable mascot, I wasn't a bit surprised. After all, if there's anything Americans know about Japan, it's that as a country, they are absolutely obsessed with cute things. The Japanese have a name for the obsession: Kawaii. The root word of kawaii - kawaisa - translates as "cuteness" in English. "Often kawaii is equated to the English word 'cute', but I think it also has a more profound connotation," said Guan Van Zoggel, a student at Leiden University majoring in Japanese studies. "It indeed can be used to describe a Japanese baby or objects that are designed to be cute." "Simultaneously, it also evokes this sentiment of maternity and affection in people, contrasting with the strictly male-oriented society of Japan. If you look at kawaii from this perspective, it's not strange that even the Japanese police forces and governmental institutions use recognizable and cute mascots," he said. American otaku, for the most part, adore the trend. In fact, if you watch enough anime, you'll notice that you start to pick up words that you hear repeated the most. And if you got a quarter for every time some absolutely adorable blue-haired girl pressed her fists to her mouth and screamed, "Kawaii!" in an anime, well, you just might be rich by now. Anime exports don't hold the monopoly on kawaii, though. It's easy to find cuteness in many aspects of Japanese life. There's an entire culture of cute mascots in Japan, in fact. "I feel [the meaning of kawaii] is very strong. Not just (Japanese) reaction, but the world's reaction– they can't get enough of it," said Erick Scarecrow, owner of art toy company ESC-Toy, whose collectibles are popular with a Japanese audience. "People can understand and translate blank expressions just by looking at a set of adorable eyes placed on inanimate objects, even if it doesn't have a smiling mouth," he said. Kawaii culture really began to develop in Japan during the early seventies. Strangely enough, it partially stemmed from a movement in handwriting where teenage girls began to use mechanical pencils and decorate their writing with symbols like hearts, stars and sometimes even Latin letters. At first the writing style, called "marui ji" (round writing) caused a controversy, and it was banned in many schools. But magazines and advertisers noticed its popularity and began incorporating marui ji in their pages and products. The style has stuck: even now, Japanese girls use marui ji and are known for using illustrated stationary. American otaku often decorate their own letters in a similar way and tend to be attracted to stationary with cute designs and colors. The handwriting movement was only one part of the trend. In the same decade, Hello Kitty was born (1974) and has successfully promoted the image of cuteness for thirty-seven years. 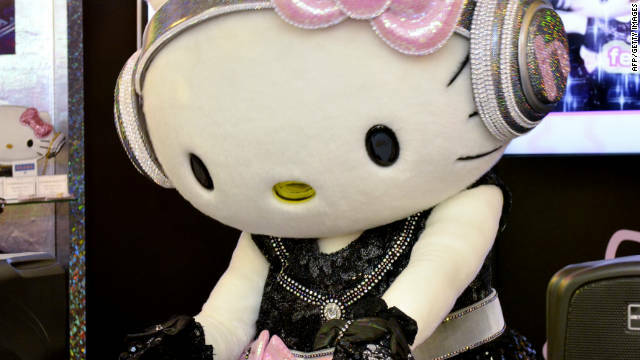 In 1976 Hello Kitty came to America and caught on as well, and is often viewed as the ultimate symbol of Japan's obsession with cuteness in their culture. Today, Hello Kitty appears on everything from jet planes to jewelry. The brand partners with dozens of major, international designers for collaborative projects, with no signs of slowing down. "It seems like a lot of that cuteness is heavily symbolic and simple in terms of design. Look at how simple the core designs are, such as Hello Kitty and Gloomy Bear. The message is clear - the two eyes and a smile. It's joyful!" Scarecrow said. To the eyes of a tourist, cuteness is unavoidable on a trip to Tokyo or any one of Japan's major cities, where kawaii characters appear on nearly every sign. That's because cuteness is a desirable quality in Japan, not just in branding, handwriting and fashion, but in manner as well. Japanese women who purposely speak softly and feign high-pitched laughter are known as "burikko." The etymology of burikko takes the Japanese words for "child" and "fish" and blends them with "to pretend or pose." Men are not exempt from being kawaii either, even though they are also expected to be manly as well. Japanese pop stars and actors often have longer hair, such as popular actor Takuya Kimura. Men are also noted as often aspiring to an asexual look. While it doesn't quite fit the exact specifications of what cuteness means for females, men are certainly influenced by the same societal mores - to be attractive in a specific sort of way that the society finds acceptable. And while those outside Japanese culture might consider kawaii to be a worrisome symptom of a refusal to mature, many otaku find it to be a sense of devotion to childlike things that remind them of their own joy. Tomoyuki Sugiyama, author of "Cool Japan", believes that the Japanese are seeking a sense of "momentary peace and an escape from brutal reality through cute things." Whether Japan's passion for cuteness in many elements of their culture may stem from a simple aesthetic reaction or a deeper need to pursue happiness, one thing is certain: There's no sign of the trend slowing down or stopping anytime soon. American otaku has fallen in love with the movement as well, and thanks to websites like J-List, happy products are now being imported for us to enjoy as well. When we look at them, we can't help but smile. And it makes one think that perhaps the Japanese have got something with this cute thing. Who can deny that everyone is chasing after a moment of happiness? I enjoyed the article, but I would suggest (and kindly ask) that next time you link to a website, you inform the reader if it's safe for work or around families. As much as I love women and their bodies, I'd rather not have a naked woman from J-List's site blare all over my screen.